Here, two natural wood treehouses are available for rent, each of which are outfitted with a full-size bed dressed in soft linens and an electric fireplace. The rentals can accommodate a total of two adults and two children, but are especially ideal for a couples' getaway. In the nearby guesthouse, there's a private bathroom (with towels provided) exclusively for rental guests, plus a cozy living area to relax in. There's also a shared kitchen stocked with coffee and tea, and breakfast is included in the rental price. Evening meals can also be prepared for an additional fee. 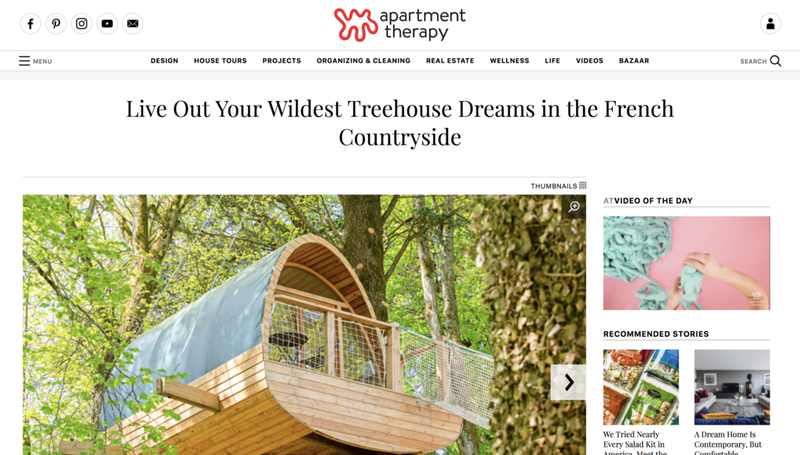 These treehouses are set in the heart of Chartreuse Regional Nature Park and surrounded by beautiful trails, lakes, mountains, and forests. It's the perfect setting for a scenic hike or bike ride, canoeing or fishing in the many rivers and lakes, wildlife watching, or a picnic. There's more exploring to be done off-property, with cities like Lyon and Annecy just an hour's drive away and the mountain cities of Grenoble (home to the hilltop Bastille fortress) and Chambéry only 40 minutes away. In the winter, guests can ski at nearby Chartreuse, a 35-minute drive from the property.